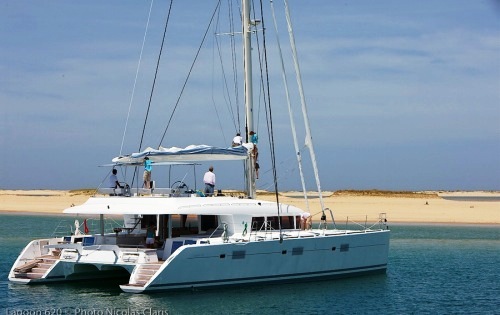 Sailing catamaran THE CURE (ex MAEVIE) is a Lagoon 620, measuring 18,90m (62’) launched in June 09. 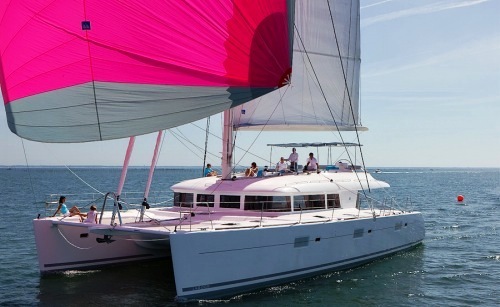 Charter yacht THE CURE can accommodate up to 6 guests in 3 cabins and charters throughout the Western Mediterranean in the summer months and the Caribbean in the winter. 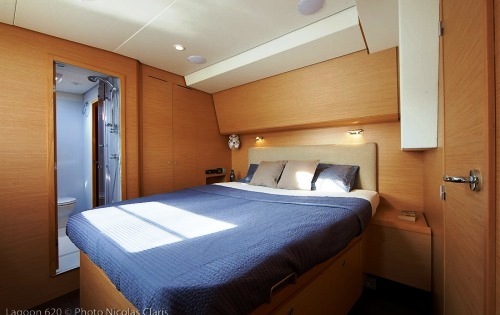 Sailing yacht THE CURE has a modern interior consisting of light oak alpi and wenge woodwork with white leather sofas and huge windows allowing plenty of natural light and a great sense of space. 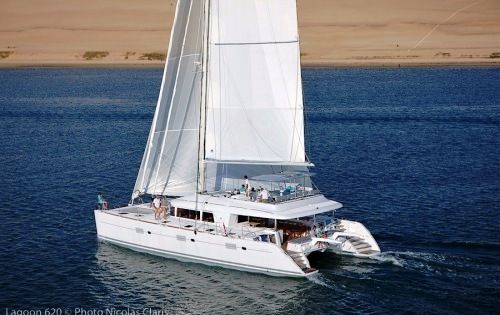 Catamaran THE CURE can sleep up to 8 guests in 3 double cabins plus a master suite, all with bathroom with separate shower. 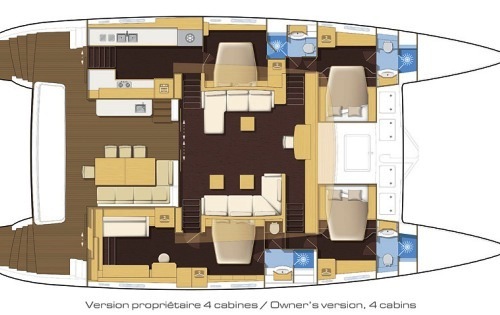 The master cabin has 2 accesses, from the cockpit and from the saloon. 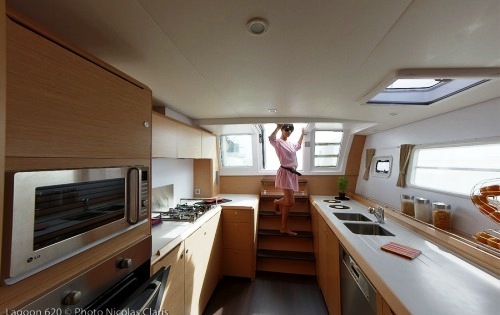 The 2009 Lagoon 62 catamaran THE CURE (ex MAEVIE) has huge deck spaces including her aft deck area with el fresco dining table. This large deck area is the perfect place to lounge and relax. 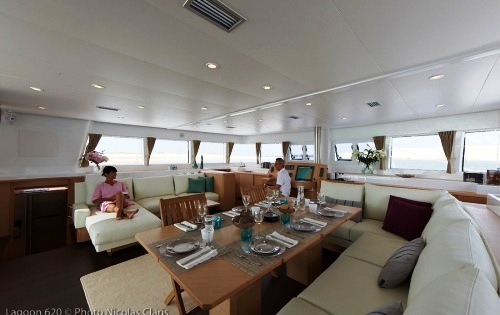 The aft deck is protected from the sun so it is a wonderful place to shelter from the sun in the peak heat of the day. 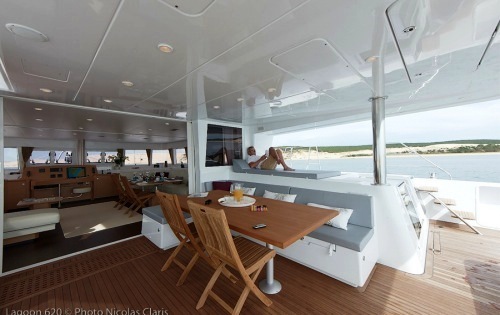 The aft deck has steps on each side of the yacht leading down to the water’s edge. 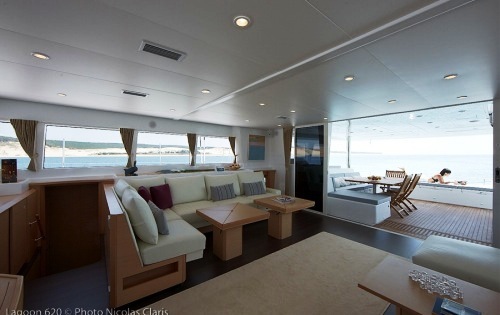 On the upper level there is an expansive fly bridge area with a bimini and sun pads – a great area to enjoy the view. 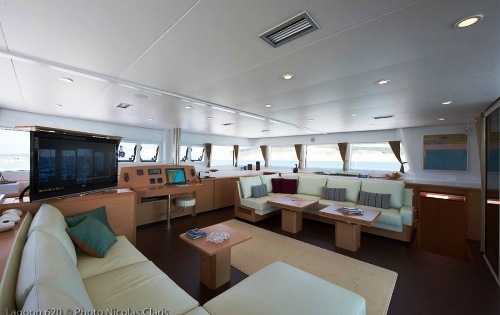 There is a further lounging area forward of the yacht where you can relax in the huge trampolines or if brave enough dive into the sea while at anchor. 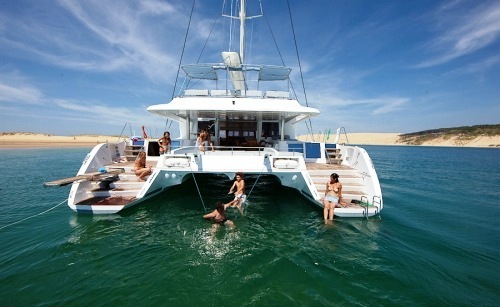 Charter yacht THE CURE (previously MAEVIE) has a good selection of toys on board including a Hard bottom dingy with 50HP, Water-skis, wake board, 2 kayaks, snorkelling equipment and fishing gear. 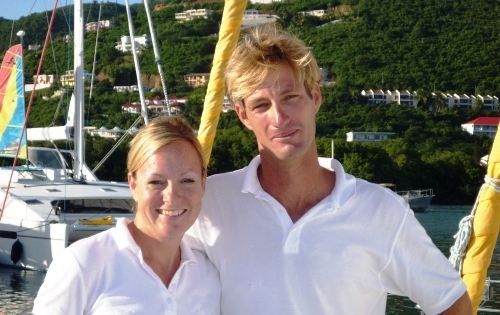 Catamaran THE CURE has a crew of 2 ready to welcome you onboard for your next luxury charter vacation. 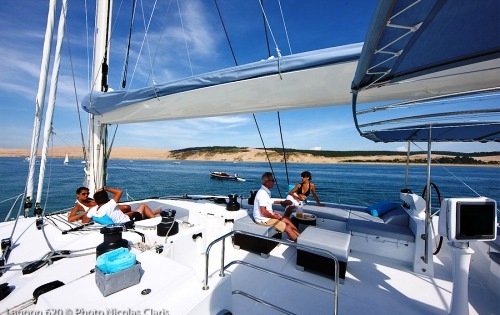 Sailing catamaran THE CURE can accommodate 6 guests in 3 queen sized cabins with ensuite bathrooms. 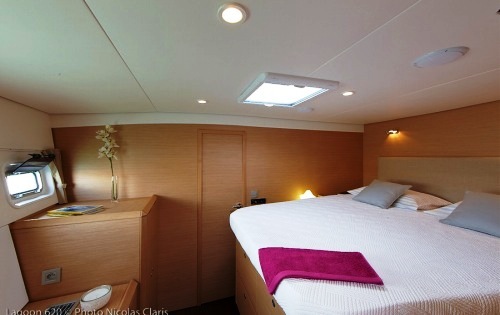 The master's cabin has 2 entrances, from the deck and from the saloon, and a suite with a sofa plus a desk. The Lagoon 620 THE CURE (ex MAEVIE) has the following Tenders & Toys: A Hard bottom dingy with 50HP, Waterskis, wake board, 2 kayaks, snorkelling equipment and fishing gear. 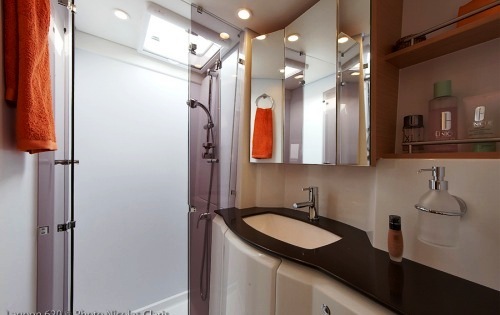 Communications include a cellular and satellite phone, fax, emails. 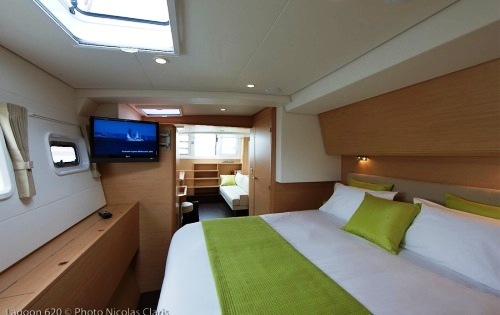 Audio Visual Equipment and Deck Facilities include TV-DVD in the saloon and master cabin, CD-Hifi- Ipod plug in each cabin, Deck shower, swimming platform, sun bathing cushions, biminis, Fly bridge.